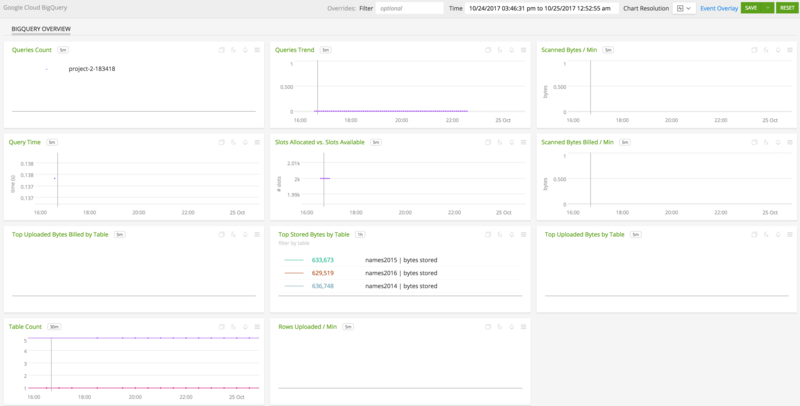 Use SignalFx to monitor Google BigQuery via Google Cloud Platform. 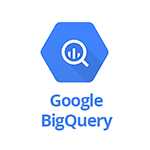 BigQuery Overview: Overview of project level metrics for Google BigQuery. Queries Count - Number of in flight queries. Queries Trend - Shows the trend of number of in flight queries. Scanned Bytes / min - Number of bytes scanned per minute. Average Execution Time - Distribution of queries execution times in seconds. Slots Allocated vs. Slots Available - Number of BigQuery slots currently allocated for the project vs total number of BigQuery slots available for the project. Scanned Bytes Billed / min - Amount of Scanned bytes billed per minute. Top Uploaded Bytes Billed per Table - Tables with top 5 uploaded bytes billed per minute. Top Stored Bytes per Table - Tables with top 5 stored bytes. Top Uploaded Bytes per Table - Tables with top 5 uploaded bytes. Table Count - Total number of tables in the project. Rows Uploaded / min per Table - List number of rows uploaded per min aggregated by table. Distribution of queries execution times. Scanned bytes billed per minute. Number of BigQuery slots currently allocated for the project. Total number of BigQuery slots available for the project. Uploaded bytes billed per minute.